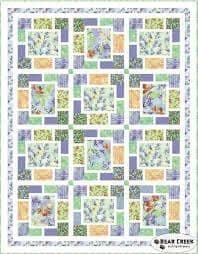 Easy Breezy Belle featuring the Belle collection from Quilting Treasures is a great beginner quilt. Made with strip sets and sashings the kit includes the pattern and all the fabric for your quilt top and binding. The finished quilt measures 58" x 74.